The Auburn Chamber of Commerce is prepared to send summer off in style this weekend with a Black & White Ball that won’t disappoint. Things were busy at the Chamber on Thursday, where volunteer coordinator Britney Milbury said tickets sales were going strong. For those who have yet to purchase a ticket there’s still time left. Milbury said tickets will be available at the Chamber offices and at the Gold Country Fairgrounds until the gates open at 8:30 p.m. on Saturday. However, she says that there will be long lines at the gates, and advises those who are interested in attending to come by the Chamber. If you already have your ticket, don’t forget to reserve a campsite, if you want to spend the entire night. Fairground camping CALSTAR is renting the baseball field above the fairgrounds to allow for free tent camping. Registration begins at 4:30 p.m. Saturday and closes at 8:30 p.m.
Sonja Vargas, a CALSTAR representative, said interest is high for the ball’s first year of offering a camping option. “I’m getting a lot of calls and e-mails (about the campgrounds) and I do expect a good turnout,” Vargas said. “Everyone is very excited that this is an option this year. Camping is one way partiers can avoid a driving under the influence arrest Saturday night. The seven law enforcement agencies that are part of the Placer County “AVOID the 7” program, funded by the Office of Traffic Safety, will saturate the Auburn area Saturday. Two officers from each agency will patrol Auburn between 9 p.m. and 3 a.m., according to Richard Blanco, DUI officer with the Auburn Police Department and Placer “AVOID the 7” coordinator. Public transportation If camping is not an option, there are other ways to stay off the road after drinking alcohol. Ball organizers have contracted with the city of Auburn transportation department to provide two shuttle buses that will make a continuous loop from the fairgrounds to Auburn area hotels. There are also local taxicab services. Additionally, ball attendees who tell volunteers that they are a designated driver will receive a special wristband that entitles them to free bottled water and two free soft drinks for the night. Blanco advised designated drivers to remain alcohol-free for the evening. Local students are in the final stretch of summer as teachers and parents get ready for the return to school. Classes begin at most Auburn-area schools this week, which means the next few days will be full of preparation, at home and in the classroom. E.V. Cain Middle School teacher Olivia Conn has her classroom just about ready for a new group of seventh-graders. Are You Ready to Head Back to Class? Yep, it’s summer, and as twisted as it sounds, that should mean back-to-school prep for parents to avoid the inevitable nervous breakdown that comes with waiting until the last minute on absolutely everything. Don’t spoil your family’s fun in the sun by stressing out on break, but give up the notion that you can tick off your long list of school lead-up chores the week before the start of a new academic year. 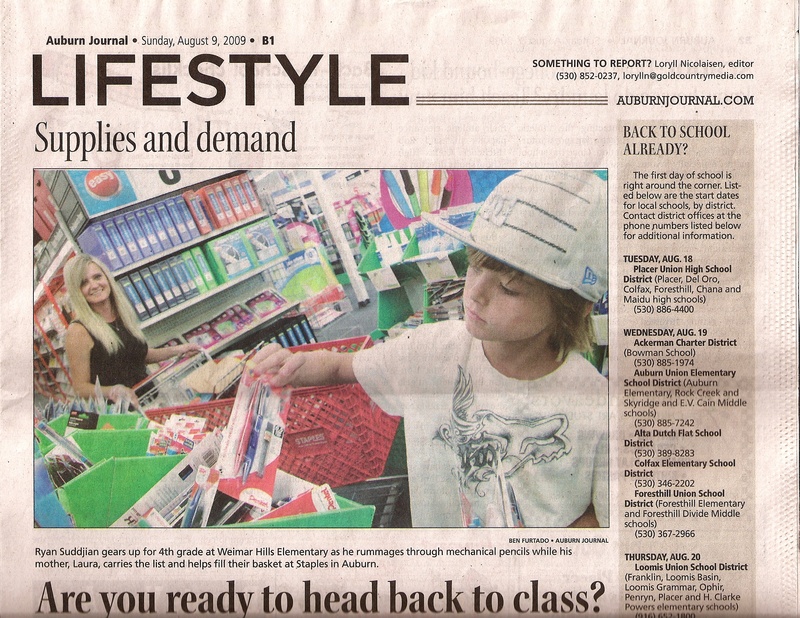 “Parents enjoy the summer, too, and they don’t want to think about school,” said Stephanie Vozza, founder of Theorganizedparent.com and a mother of two school-age boys in Rochester, Mich. If you’re looking to help out the community, attending the Auburn Rotary Club annual barbecue might be the most fun you’ll ever have giving back. Proceeds from the benefit dinner-auction will go to local charities including the PlacerArts Council, student scholarships, Project Auburn, Boy Scouts, Little League, and the Peace for Families holiday dinner. For dinner, Auburn’s Rotary Club will be barbecuing salmon, chicken, baby back ribs, and tri-tip. Cocktails and dinner will be served at 5:30 p.m. Meals are included with the purchase of a ticket, which you can buy at the door or ahead of time from any Rotarian. This past week, many Auburn residents lost everything in the 49 Fire. Fortunately, local churches are working to help them get it all back. Several churches are collecting food and clothing, though many take these donations to the Salvation Army and Red Cross and advise those looking to help drop off contributions directly with either group. However, many places of worship have specific plans for helping fire victims. At Bayside Auburn Church, Cheryl Brown, associate minister of impact ministries, had a long list of ways to help on Thursday. At the meeting, the congregation came together to decide where they could do the most good. One of the church’s small groups organized a “donation tree,” keeping a master list of items donated to the church. Brown also said they will be sponsoring a benefit concert organized by the group Speak With Love on Sept. 26. The group is still looking for a venue to accommodate the large crowd they anticipate, Brown said. All proceeds of the event will go to the Red Cross and Salvation Army. That evening from 7 p.m. to 9 p.m. at the church’s Nevada Street location, they will host Hopequest, a time of prayer for the community and fire victims. Auburn residents have come together to help victims of the 49 Fire recover from devastating losses. However, some locals are concerned about where their donations are ending up. Rumors have been circulating that money and supplies given to the Salvation Army and the Red Cross won’t reach fire victims. David Morikawa, the Red Cross volunteer managing the relief effort for the 49 Fire, says that isn’t true. Morikawa said he understands the concern, and wants to be sure the community knows exactly where their donations are going. He explained that though they do offer donors an opportunity to donate to a general Northern California disaster relief fund, the individual decides exactly where their money is going. So money intended to go to fire victims will go to fire victims. As of Thursday evening, 49 Fire donations totaled $29,000 in cash and pledges. Ken Tokutomi, chairman of the Salvation Army Advisory Board of Auburn, also wanted to assure those looking to donate that their contributions are staying in Auburn. 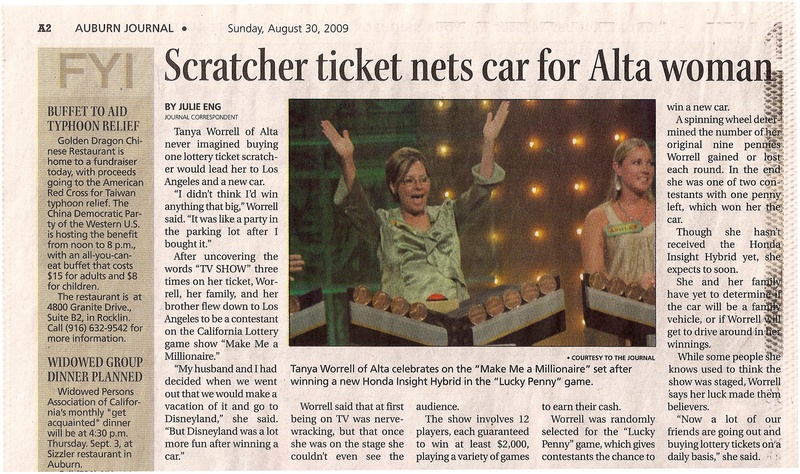 Tanya Worrell of Alta never imagined buying one lottery ticket scratcher would lead her to Los Angeles and a new car. Though some numbers are down, excitement is high for the 18th annual Black & White Ball. According to event organizers, lagging ticket sales are nothing to worry about. “In this economy, people are careful with their money and where they’re spending, and that’s being reflected in the ticket sales,” said Bruce Cosgrove, executive director of the Auburn Chamber of Commerce. However, he is confident that sales will meet expectations. Entertainment Chairwoman Rosie Mietzel estimates they are about $10,000, or roughly 150 tickets, behind last year. “We think it’s going to be a last-minute decision for a lot of people,” Mietzel said. Cell phones are everywhere these days – including in drivers’ hands. In spite of state law, many still use handheld cell phones while driving. Texting – which usually requires looking at the cell phone – can be particularly dangerous. In 2008 the state passed legislation that made the use of handheld cell phones illegal while driving, and since January the California Highway Patrol has been pulling over drivers for reading texts and e-mails on their phones. Though these new laws were intended to protect drivers and make roads safer, an AAA study found that many people feel less safe driving today than they have in the past. Most Auburn-area residents interviewed Downtown on Thursday agree. Faced with concerns about potentially censoring the president, the Auburn Union School District has amended its original plan to require a permission slip to view Obama’s speech, which aired on Tuesday. Several schools will be showing the president’s address in classrooms on Wednesday, and will offer the opportunity for students to opt out. As of Tuesday, E.V. Cain Middle and Rock Creek Elementary schools planned to air the speech for students on Wednesday. At E.V. Cain, social studies teachers were given the option to show the speech but were told to remind students of the option to opt out with a note from their parents. Officials at Rock Creek Elementary said the speech would be shown in classrooms, and had copies of the transcript available for preview in the front office. Sam Schug, principal at Auburn Elementary School, said on Tuesday they do not plan to air the president’s speech. Schug said he gave the teachers the opportunity to show it in their classes, but that none had expressed much interest in doing so. Superintendent Michelle Schuetz said on Tuesday that she thinks most parents are happy with the resolution. “Most concerns came from parents just not knowing what was in the speech and what their children were hearing,” Schuetz said. She added that given the chance to opt out, no students at Rock Creek Elementary School had done so. Brad Kearns, father of two students in the Auburn Union School District, said he was glad the school board changed its initial plan, but is somewhat disappointed with the outcome. Parents of some students in the Placer Hills Union School District think the president is being censored. President Obama requested his televised speech to schoolchildren in Washington D.C. be broadcast on Tuesday in schools across the nation. In response to this news, area parents voiced their concerns to Auburn-area school districts. Some felt that the president would try to promote his political views, which led to postponed and selective airings of the speech. Several parents with children at Sierra Hills Elementary School were upset that they were given no indication of the school district’s plans for showing the address to students prior to its live airing. Hannah Schwartz, a former high school social sciences teacher and mother of two children who attend Sierra Hills, heard from her kids after school that they didn’t watch the speech. Molly Wollff, also a mother of two Sierra Hills students, was told by a district official that her children would only see selected portions of the speech.